Shout out to all you Chipotle lovers…you have to check out Pancho Villa right up the street. Pancho Villa is a casual, traditional Mexican restaurant that serves huge portions at down-to-earth prices–perfect for a high school student. There is a multi page, comprehensive menu that offers every Mexican dish you could ever think of. If you are craving a taco, burrito, nachos, guacamole, fajitas, enchiladas, chili con carne, tostadas, quesadillas, or a plate with a combination of any of these items, this is the place for you. The absolutely delicious guacamole is freshly prepared right alongside your table and served with a basket of warm tortilla chips that is replaced promptly when they run out. And be warned – they will run out quickly as you devour the guacamole, and you won’t be able to stop eating them! Both the appetizers and the entrées are served with heaping amounts of food, so I recommend going with a few people and sharing. Try the traditional black bean soup to start. It’s dark in color, packed with black beans, and nice and warm on a cold winter’s day. The Mexican pizza ($7.95) is a plate full of flour tortillas, plenty of sour cream, a yummy red sauce, and melted cheese that is perfect for sharing. I ordered the burrito supreme for $12.95 when I was there. It was the size of a pillow! The soft flour tortilla was stuffed with yummy seasoned shredded beef and fresh lettuce and topped with melted cheese. It was served with a side of traditional rice and beans and sour cream for dipping. It was so big that I brought home half of it to have for lunch the next day; not a bad deal! The woman at the table next to me ordered the sizzling chicken fajitas. I heard and smelled them coming before I even saw them. There were plenty of slices of chicken served with sautéed peppers, onions, and tomatoes. It came with a side dish of flour tortillas, rice, guacamole, sour cream, and pico de gallo. Once I saw it delivered to her table, I began questioning my order. Also keep in mind that they offer several delicious vegetarian dishes as well if you are not a meat eater. The look and sound of Pancho Villa makes you feel like you are in a small cantina in Mexico and not right on Jericho Turnpike. There are sombreros hanging on the walls and traditional style archways adorned with bright Mexican tile. The peppy Mariachi music playing in the background sets the mood. It is a relatively small restaurant, so I recommend making a reservation. They are open for both lunch and dinner every day of the week with the exception of Mondays. 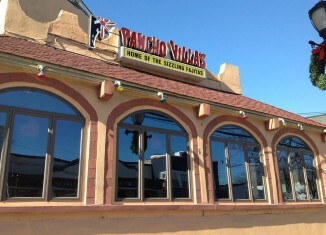 Pancho Villa is local, affordable, and definitely worth a try. You may leave very full, but definitely not disappointed!